There are generally considered to be two kinds of knitter: those who are process knitters and those who are product knitters. I used to consider myself firmly in the product camp, choosing small projects for that instant gratification, look I made a thing feeling. That said, quite often recently I've found myself not completing a project, ripping it back (at more than 75% complete) and not feeling particularly bothered by it, which would seem to lump me in the process category, where I knit because I want to knit, but I'm not particularly fussed by producing anything of particular worth. Journey, not destination. Of course, there are more than two kinds of knitter. In fact, there are as many kinds of knitter as there are actual knitters - no two are exactly alike, but they can be sorted into broad categories. The next great schism is probably monogamous/non-monogamous. I'm distinctly non-monogamous with my knitting. I've got *cough* projects in various stages of completion, and I don't feel any need to finish one before starting another. In fact, you could even term it start-itis. I start lots of things, but after a while, the enthusiasm wanes and I move onto something shiny and new. It's easy to be whatever kind of knitter you are when you're knitting for yourself, but when you knit for a friend (or family), things necessarily have to change. All the usual distractions and mid-project lulls will still kick in, but now you have somebody waiting for something, which is why it's really important to only ever offer to knit something for someone who will appreciate the time and effort you're putting in, and treat the finished item with the love, care and attention that it deserves. Four years ago (excuse me for a moment while I boggle about how time has flown. Ok. I'm done. ), I was in the midst of a very serious knitting addiction. 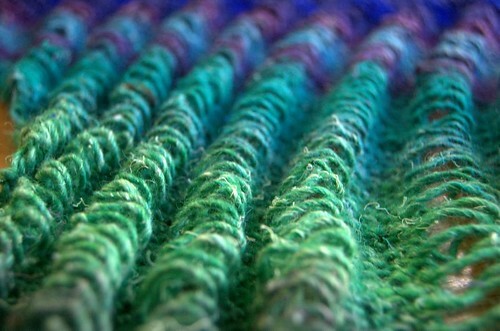 My drug of choice was the Clapotis, a large scarf/wrap which captured my attention. I think by the time I was done, I'd knitted five and a half Clapotis(es?) in various sizes. The final, full-size Clapotis went to the lovely Lori Smith, who'd admired one of mine (I only have one still in my possession) and asked if I'd knit her one. By the time I started knitting hers, in truth, the attraction began to wane, but although it took me far longer than I anticipated, I kept going through the miles of middle section, and finally, to the end, and I was so pleased that I had, because it really suited her. Recently, Lori mentioned on twitter that she would like a snood knitted, and I offered my knitting services once more (there is no drug greater than the sincere appreciation of a handknitted item). She had very specific ideas in mind (which is a good thing) and a couple of weeks ago we met up at John Lewis in Oxford Street go do some yarn shopping. 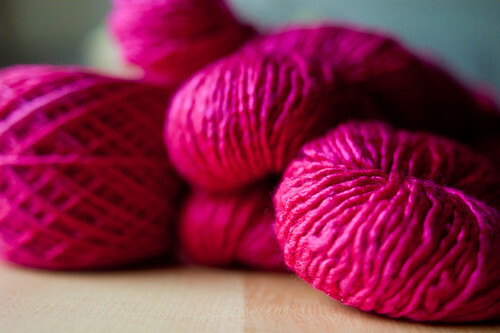 It was originally supposed to be red and woolly, but after wandering round, our attention was grabbed by a 50/50 wool/silk blend in a pink so bright it was almost offensive. Pink is not the colour either of us would go for by choice, but it just refused to be put down, so not long after, we left John Lewis with a bag full of pink yarn and a pattern. I'm about 75% of the way through the snood, and while the yarn is wonderful to work with and I've enjoyed the feel of it running through my fingers as I knit, I'm reaching the knitting equivalent of the point of maximum dread. You know the end is near but it isn't near enough to give you that second wind to push to the end and the pattern has leveled out to being knit, knit, knit all the way. With each day, the urge to start something new grows. It's a sickness, I know. The point of this post is not to have a moan about knitting for someone else. I love knitting for people who appreciate it. It really is a wonderful feeling when you've put time and effort into something and that effort is appreciated. It's just an acknowledgment that my inclination is to start something knew, even though I know the satisfaction will be less than that which will be felt by finishing this and handing it over. After all, the first step to recovery is admitting you have a problem. Hi, my name is Ann and I have chronic startitis. It's also an excuse to show off some pictures of yarn and stuff, because there's not nearly been enough knitting on this blog so far.